Is Dad hard to buy for? Does he love candy? Snack food? 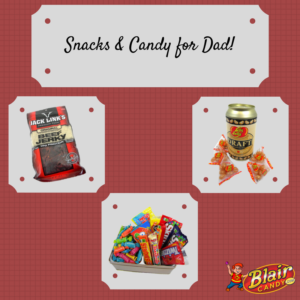 Blair Candy has all of the candy and snacks that Dad loves to enjoy in stock! Here are a few things that you can give your dad, grandad, or any other dad you know that are sure to put their snack cravings to rest. Game Time Basket: Gather all of Dad’s favorite snacks, drinks, and maybe even a new team shirt, and put it into a gift basket. He’ll love this assortment of treats when the game is on or while he’s waiting for it to start. Car Trip Pack: Going on a car trip with Dad sometime soon? Find all of his favorite car snacks, a guide book of the area, and a new travel mug for your travel minded dad. He’ll enjoy the extra snacks, and directions, when he’s on his next trip! Movie Marathon Bucket: If you can find your dad in his chair, watching a good movie or two on the weekends, this gift is for him. Pack it full of classic and novelty candy, popcorn, and either a few DVDs or a gift card for his favorite movie theater. But what do you do if Dad lives far away? 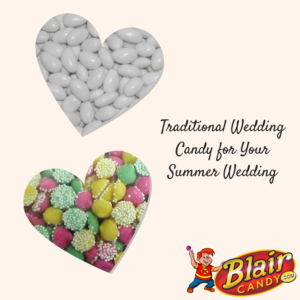 Blair Candy still has a solution. We have plenty of freshly made cans of novelty candy and snacks that are ready to ship right to your Dad. Be sure to order your treats or gifts today to ensure they arrive on time for Father’s Day! Candy Baking Chips to Add to your Recipes! Dessert is easily one of the best things about a meal. So why not make it better by adding baking candy by Hershey’s? Blair Candy has ice cream toppings and baking chips in addition to candy in bulk. With chocolate, butterscotch, caramel, and even Reese’s Peanut Butter chips, you will have delicious snacks in no time. But what should you make with these chips? Blondies are a wonderful marriage between cookies and brownies. You can either add regular chocolate chips to these or make them extra special with butterscotch chips. This recipe will show you how to make Butterscotch Blondies. Chocolate chip cookies can pretty much make any day a lot better. While chocolate chips are the best option here, nothing says you can’t use peanut butter chips or butterscotch ones. If you want to make the chewy chocolate chip cookies everyone loves, try this recipe here. You don’t have to make cookies or brownies! You can add baking chips to any bread recipe for a great treat with a cup of coffee or tea. You can add fruit or other baking chips to for a variety of flavors. This Raspberry chocolate chip bread gives you the best of both worlds. Make it today by getting the recipe here. There’s plenty of other things you can add these baking chips. Whether you add them to new recipes or old ones, you’ll love what you make. Shop now at BlairCandy.com to start baking wonderful new desserts! eFrutti Sour Soda Bottles – This box is ready to display! Every box has 80 individually wrapped gummy soda bottles. These bottles have a sour and sweet grape or cherry flavor that will surprise anyone. Fun Dip – Who doesn’t love Fun Dip? This package has 48 packs of either RazzApple MAGIC or Cherry – YUM – DIDDLY flavors ready to enjoy. Lightening Bugs – This candy is all kinds of fun. Each package of this gummy candy has tweezers that lights up the gummies. You can keep the tweezers after to light up your favorite gummy snacks! 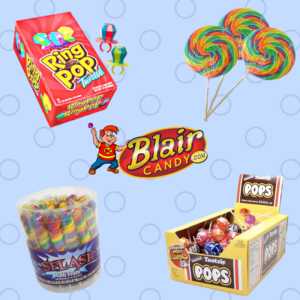 There’s plenty more of these cool concession candy options online at BlairCandy.com! Choose from staple treats to new snacks and candy that everyone will want to try. Shop now to kick off summer with new treats. Savory and Sweet: Combos Make a Great Snack! Combos Chocolate: Combos start with a pretzel shell, so what’s a better treat that chocolate and pretzels? These bite sized bits satisfy that salty and sweet craving in a convenient way! Combos Buffalo Blue Cheese: If you love that spicy, tangy flavor of buffalo sauce, these Combos are what you should reach for next snack time. Get the taste of buffalo sauce with blue cheese without having to order wings. Combos Cheddar: This classic Combo has classic cheddar inside each pretzel bite. These are great anytime. They also please a number of palates, which make them a great snack for lunches, parties, or just whenever you need a quick bite. 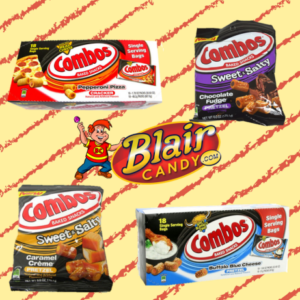 There are plenty of other flavored Combos for you to try at BlairCandy.com! Grab these bulk snack food choices today to have plenty of options whenever snack time arrives. Brachs Salt Water Taffy: Go with the classic choice with this 7lb bag of taffy. Each bag has an assortment of flavors and colors that everyone will love. Use this bag to fill your candy jar, or break them down to use in gift packages. Air Heads Taffy: We sometimes forget that this is based off of a classic! Try a variety of flavors, ranging from sweet, sour, and even mystery flavors. BB Bats Taffy Lollipops: This retro candy has three flavors that have stood the test of time. Share these with someone who loved them as a child or someone who is brand new to this candy. Regardless, they’ll love it. 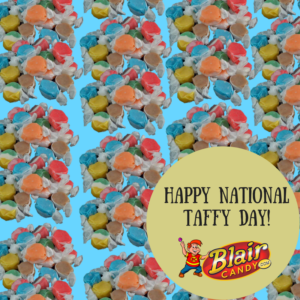 Don’t forget to celebrate National Taffy Day. 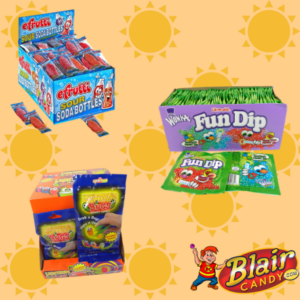 Blair Candy has the treats you need, ranging from retro favorites to brand new twists for you to choose from. Shop now to start celebrating. New Hershey’s and Reese’s Candy You Should Try! Reese’s Crunchy Cookie Candy Bars have a Reese’s cup stuffed with crunchy cookies. Enjoy the peanut butter taste you’ve come to know with crunchy bits stuffed right in. Hershey’s Cookie Layer Crunch has layers of their famous chocolate with a crispy cookie for the ultimate chocolaty treat. Choose from dark chocolate and mint or a milk chocolate and caramel combination for a delicious snack time. Reese’s Pieces Big Cup has a jumbo peanut butter cup with Reese’s Pieces inside for an extra peanut butter punch. These king sized packages are great to share and save for later. 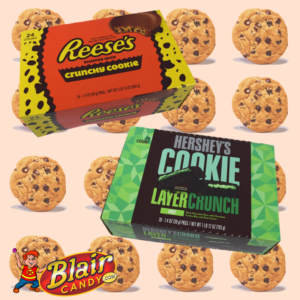 There are plenty of new things you should try, especially with Hershey’s and Reese’s at Blair Candy. See these and other new treats by browsing our Just Arrived page. There, you’ll find specialty candy, novelty treats, and even new twists on your favorites. Shop now for the latest candy today! Why use boring old marshmallows when you can use colorful, fun Charms Marshmallows? 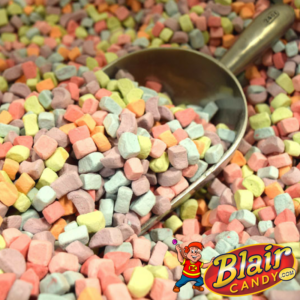 Blair Candy has bags of these fun marshmallows in addition to candy in bulk for you to enjoy. So what do you do with a giant bag of colorful marshmallows? Add Them to Baked Goods: What makes cookies more colorful, fudge more unique and cupcakes more festive? Charms Marshmallows! Add these to your favorite cookie dough, homemade fudge, or decorate your next batch of cupcakes. Spice Up Your Cereal: Want extra sugary goodness in your cereal? Just take a handful of these marshmallows and add them to your favorite cereal. You can give regular cereal a kick and add more fun to your already marshmallow-filled cereal. Make Cocoa More Colorful: Even though it’s summer, a cup of cocoa is still a great way to end an evening. Instead of regular marshmallows, add these little Charms Marshmallows to make your cocoa more special. There are plenty of other things you can do with these marshmallows. 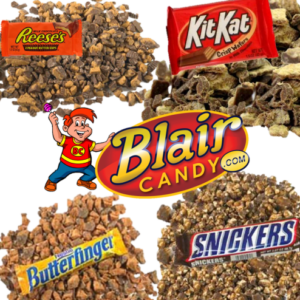 Be sure to stop by BlairCandy.com today for the latest bulk candy treats and specialty items like these. You can get an 8oz bag or even a 5lb bag of these colorful treats. Shop today to get your marshmallow treat fix! While many have a few set favorites, there’s always something new to try when it comes to sugar free candy. So what should you try this month? Sugar Free Gummy Fish: These gummies are super colorful and packed with flavor! Eat them alone or add them to a sugar free Jell-O for more fun. Sugar Free Jelly Belly Beans: Do you love all of the unique flavors of Jelly Belly, but don’t want the sugar? This bag has just that! You’ll get 10 flavors without the guilt. Sugar Free Cinnamon Candy: Get the bite of hot cinnamon without all the sugar in these candies. They’re individually wrapped, so you can put them in a candy dish or throw a couple in your purse for easy access. 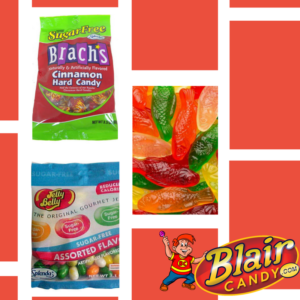 These are just some of the sugar free candy options you’ll find at Blair Candy. Shop now to find bulk bags and individual treats that anyone will love!